Visual barriers in large flights (Fig. 1) or aviaries are one of the more frequently used fantastic ideas to curb mate aggression so females are capable of escaping from the male�s view. Cockatoos tend to have the out of sight, out of mind mentality. Many simple objects around the home can be used for this technique, burlap, curtains, wood paneling, sheet metal or plastic siding which can be removed or replaced throughout the year when it is less necessary. Browse may consist of tree branches is an interesting alternative with foliage to block views of certain areas of the flights. This is an essential technique in giving better exercise during flight to dodge these obstacles during flight to help utilize all the muscles not frequently utilized in smaller enclosures. This diagram was extracted from the proceedings of the IV International Symposium on Breeding Birds in Captivity. Sept. 2007. Article submitted by Rafael Zamora. Asst. Curator from Loro Parque, Tenerife, Spain, Canary Islands. Adding an extra feeding station to the enclosure in question or even two is essential in avoiding alpha representatives in impuning or ostracizing other members of the aviary to the point of starvation. Hiding feeding stations behind the visual barriers is the perfect solution. During some experiments at our facility, every time an aggressor found a member of the same aviary made an attempt to approach a feeding station, the dominant bird would always reinforce their territory and scare the inferior bird from eating; this normally results in the inferior bird, sitting at the lowest point in the enclosure fluffed up and being careful to any move it makes for fear of gaining attention of the company it keeps in the aviary. When the dominant bird (generally males) in the aviary cannot see the females, aggression and territorial behavior disseminates and the other bird can eat with minimal to no disturbance. How the bird judges that starvation is a better ultimatum than being attacked or fighting back I wish I knew the answer to but if we are not around or alert to these sudden changes, this can sometimes be a fatal judgment call. 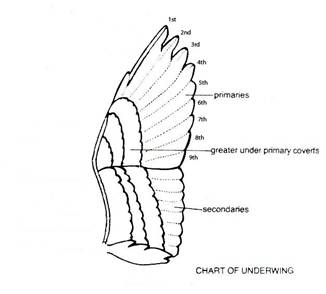 When managing males with signs of territorial or aggressive nature, one more frequently used technique is to clip 5-7 feathers on each wing total of every second primary flight feather (eg. 2nd, 4th, 6th, etc.) to decrease wind resistance during flight which enables them to normally gain more speed. This will essentially slow down the male in flight when housed in large flights; he will still be capable of flight, just not as fast in flight as the females. In smaller enclosures, clipping the first 5-6 primary flight feathers (eg. 1st, 2nd 3rd, 4th, 5th) will completely disable him for flight and give the female a good standing chance in escaping. By now, it should be common knowledge that the larger the aviaries one can provide the better the health, vigor and condition the birds can acquire and utilize. Exercise is something most aviculturists tend to underestimate. I find the more exercise they can achieve, the better health they are altogether, the more stamina and more energy they have which in essence is exercising their heart breast and wing muscles that cannot be achieved in 1.2 � 2 m. enclosures, this goes with all birds in enclosures compared to their particular sizes. Keeping them in smaller cages may be enough for them to flap their wings and probably sufficient to keep them from being claustrophobic, but in my opinion, could be one reason such negative behaviours such as plucking or barbering feathers are rooted from pent up or suppressed energy. Foraging and enrichment is essential to help minimize unnatural behaviours and help stimulate natural ones. There are many different strategies to create these conditions like using browse, nest excavating, and other types of environmental enrichment. Browse can consist of any materials that help encourage animals to keep busy. Some examples of the materials we use are leaves, branches, twigs, logs, hidden foods and treats hidden or placed within different areas of the enclosures. We use natural cedar branches which can be sometimes commonly misled as dangerous use in the pet industry. Cedar shavings normally available on the store shelves are treated and dried which produces the fine fibrous particles that cause these frequent allergens. We have been using our natural cedar branches for 4 years to date and are hand picked right on our premise, they have a substantial amount of moisture content and chewed within days or weeks of being introduced into their aviaries. We also harvest natural branches of varying diameters from 1cm � 10cm; these are constantly falling to the forest floor from the strong winds we tolerate being near the lakes. We are surrounded by farmland and virgin forests which is never exposed to any chemicals or pesticides so never has been a real threat or concern. Also in these oxygen rich forests, we find surplus of naturally rotted out and hollowed out tree logs which we are acquiring at any opportunity we can to introduce to our birds. I find this one method the most rewarding simply to watch them excavate these logs, with no wiremesh ladders or steel siding to adjust to. The birds crawl in and out by the imperfections of the log helped by their developing strong claws, and as in nature they use the elbows of their wings to assist in their mobility to come in and out. Excavating and modifying these logs for nesting takes several weeks of preparation for them. This is a great benefit to us as aviculturists for we require less attention to pay to these birds for more activities. This is one of the perfect opportunities to consume substantial amounts of their time which is a distraction from potential repetitive or neurotic behaviours. In traditional Canadian aviaries this is not as easily achieved, laying eggs and incubation preoccupies another month, raising the chicks is another 3-4 months. When one adds this time up, there is very little effort into finding things for the birds to occupy their time rather than doing little to no activities. The final area of discussion that will be touched on will be an overview of the first 2 chapters and hope to conclude some final ideas as to how we can still salvage the genetic representation we have left to work with in Canada.